Extruded tempered aluminum provides the Desk Ruler with durability, ultra smooth edges and a satin smooth finish. 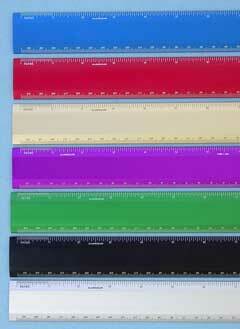 The photo anodized calibrations in inches and centimeters resist cleaning or rubbing off with solvents or cleaners. These 1¼" wide, two bevel rulers are designed for the most demanding office or school use. 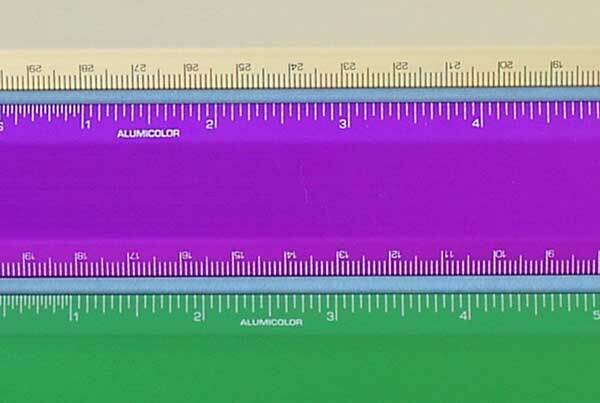 This Two Bevel Ruler has all of the same features as the Desk Ruler plus a neoprene recessed backing that grips better than cork and does not dry out or chip off. Dimensions: 1.25" wide, 0.146" thick.